February 23, 2010  Expectations are high for the military offensive in Marjah, the informal beginning of President Obama's new strategy to turn around the increasingly deteriorating situation in the country. Analysts say the Obama administration must show tangible success to keep the American public — and possibly NATO allies — on board. February 12, 2010  Earlier this week, the U.S. Treasury Department announced sanctions on companies run by Iran's Revolutionary Guard Corps. As the Obama administration ups the ante, should it frame sanctions in protest of human rights violations or of Iran's nuclear program? January 27, 2010  President Obama sent a clear warning to the Afghan president on corruption, but didn't address other issues being raised about the war. January 27, 2010  The president said both countries face increased isolation and stronger sanctions. January 20, 2010  One week after a powerful earthquake shattered Haiti, humanitarian aid is getting to the people. But the distribution of food and water and other essentials is slow — and desperation is growing in the capital city and elsewhere. Officials hope security forces — United Nations, American and Haitian — can keep a lid on violence. 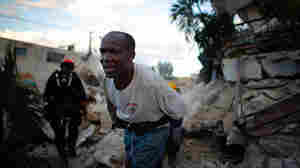 January 18, 2010  In the Haitian city of Leogane, an estimated 80 percent of the structures collapsed in the earthquake. By the time the first responders arrived over the weekend, they failed to rescue anyone from the rubble. 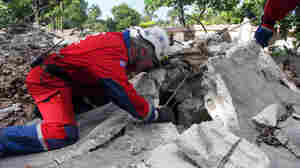 January 17, 2010  The teams are moving through Haiti's capital city, trying to locate people who might still be stranded beneath collapsed buildings. One convoy of three dozen search and rescue workers from Spain and Iceland, who are running out of time, face the challenges of searching too many buildings — and chasing false rumors of survivors. January 15, 2010  The multitude of problems and frustrations surrounding the earthquake relief effort in Haiti is played out at the country's largest airport in Port-au-Prince. 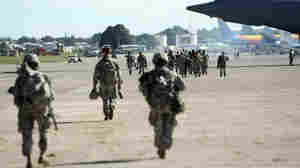 The quake damaged some of the tiny facility's systems, and the U.S. military has taken over control of airport operations. January 8, 2010  The U.S. is sending thousands of additional troops — and other resources — to Afghanistan in a bid to wipe out al-Qaida. But the attempted Christmas Day bombing was planned in Yemen and allegedly carried out by a Nigerian. Should the U.S. be focusing so much of its efforts in Afghanistan? December 23, 2009  The Obama administration is calling on Afghanistan's government to tackle widespread corruption, but some say the international community shares in the blame. Bribery and extortion have become a way of life in the country. 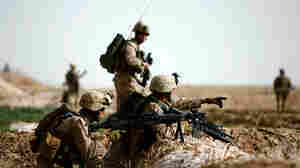 December 21, 2009  There are many hurdles in Afghanistan as President Obama deploys thousands of additional U.S. troops. In the first of a five-part series, we look at one of the biggest challenges: the government in Kabul. 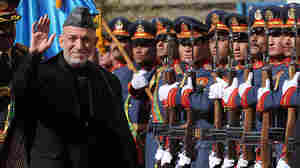 Will President Hamid Karzai reduce corruption and provide better services for his people? December 2, 2009  During his speech at West Point on Tuesday night, President Obama warned the Afghan government that the U.S. commitment is not open-ended. 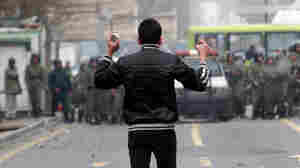 He said that ultimately, Afghanistan will have to take responsibility for its own security.